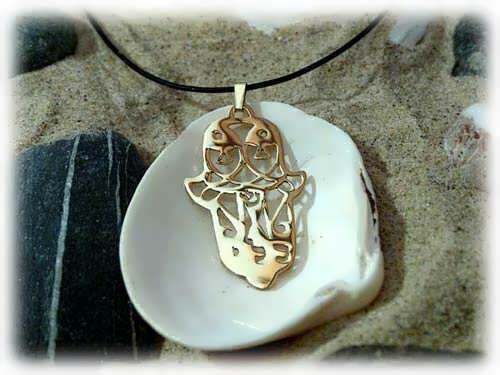 The Hamsa pendant symbol is known in Islamic societies as the hand of Fatima or the Eye of Fatima, and in the Jewish lore as the hand of Miriam or Hamesh (5) hand. The Hamsa serves as an ancient talismanic way of averting the evil eye and providing a "protecting hand" or "Hand of God". The Hamsa appears often in stylized form, as a hand with three fingers raised, and sometimes with two thumbs arranged symmetrically. 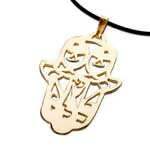 The symbol is used in amulets, charms, jewelry, door entrances, cars, and other places to ward the evil eye. The Hamsa origin is believed to predate Islam. The symbol was previously used in Punic religion, where it was associated with Tanit. Tradition in Islamic cultures associates the symbol with Fatima Zahra, daughter of the prophet Muhammad. 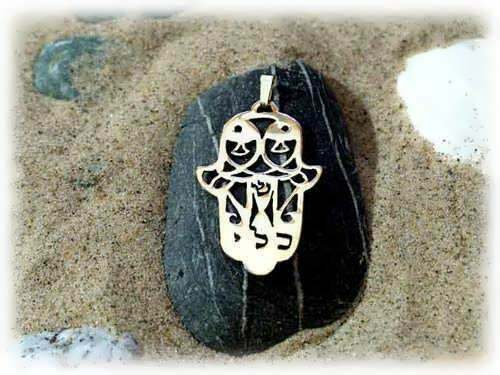 In Israel and in Jewish culture it is most commonly known as "Hamsa" or "Chamsa", without any Islamic heritage connotations. Some sources link the significance of the five fingers to the five books of the Torah or to the five pillars of Islam, though this connotation may have been attributed after the fact to a symbol that quite possibly pre-dated both religions. This Hamsa pendant contains the Hebrew letters "Kaf", "Lamed" and "Yood" taken from the Sacred Hebrew 72 names of God - a combination used for fertility.